Situated on the Vatican hill on the right bank of the Tiber river and within the city of Rome, the Pope has full legal, executive and judicial powers over the Vatican City State. Although it is both sovereign and independent, this sphere of influence is merely a drop in the ocean compared to the 17, 000 square miles that the pope previously held temporal rule over during many centuries prior to the formation of a United Kingdom of Italy. During the period of great border reconstruction and unrest within Europe during the mid 19th Century, the Pope lost most of this influence to the Kingdom of Sardinia under the unification of Italy. During this struggle, between 1860 and 1870, the Italian army seized weakly defended Rome and made it the capital of Italy. 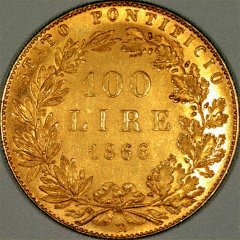 By the Law of Guarantees of May 13th 1871, the temporal power of the Pope was abrogated, and the territory of the papacy was confined to the Vatican and Lateran palaces and the villa of Castel Gandolfo. 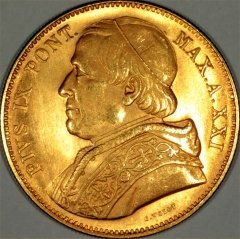 Although this ruling guaranteed a special status for the Vatican area, along with spiritual freedom and a generous income for the Papal ruler, Pope Pius IX and successive Popes failed to recognise the validity of this ruling. It wasn't until The Lateran Treaty of February 1929 between the Vatican and the Kingdom of Italy the autonomy of the Holy See was established. 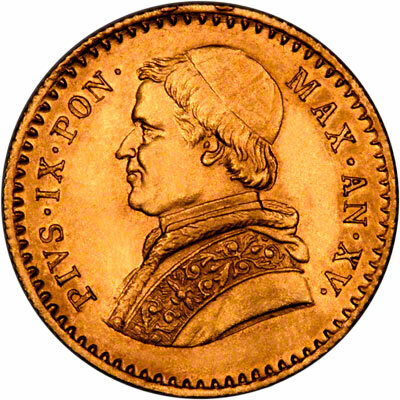 The coin denomination used by Papal States include zecchino, (plural zecchini), and lira (plural lire). The lira coins were denominated in amounts of 12, 24, 48, and 96. These values seem strange to us now because we are all used to the decimal system. 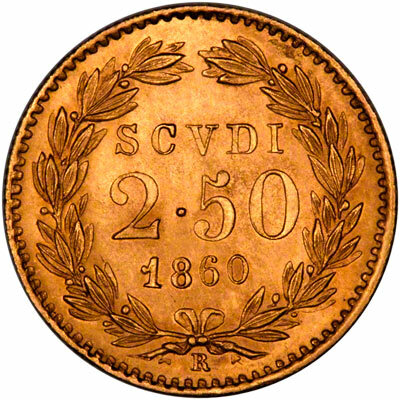 According to Krause, the 48 lire coins were struck in .909 fine gold which strikes us as unusual, we would have expected them to be in 22 carat (.9166) as with the other three lire denominations. We have used the fineness quoted by Krause, as the editors may have greater knowledge than ours. A seated personification of Papal States with the legend "REPUBBLICA Papal States ANNO 1" on the obverse, and a bundle of fasces, topped by an axe and a liberty cap surrounded by a laurel wreath, with the inscription "NELL UNIONE LA FORZA", with the date 1798 below, on the reverse. Please see our Papal States page.